The Petition challenging rejection of impeachment motion against Chief Justice of India Dipak Misra by Vice President of India Mr. Venkaiah Naidu has been listed on Tuesday before a Constitution Bench comprising Justices A.K. Sikri, S.A. Bobde, N.V. Ramana, Arun Mishra and A.K. Goel. The Petition, filed by Mr. Partap Singh Bajwa and Mr. Harshadray Yajnik, was mentioned before a Bench headed by Justice J. Chelameswar today. Also comprising Justice S.K. Kaul, the Bench had, after some deliberation with the Counsel, directed them to appear before it at 10:30 am on Tuesday. However, this 5 Judge Bench with Judges from number 6 to 10 in seniority has now been constituted to hear the matter tomorrow. It is unclear as to who constituted the Bench. 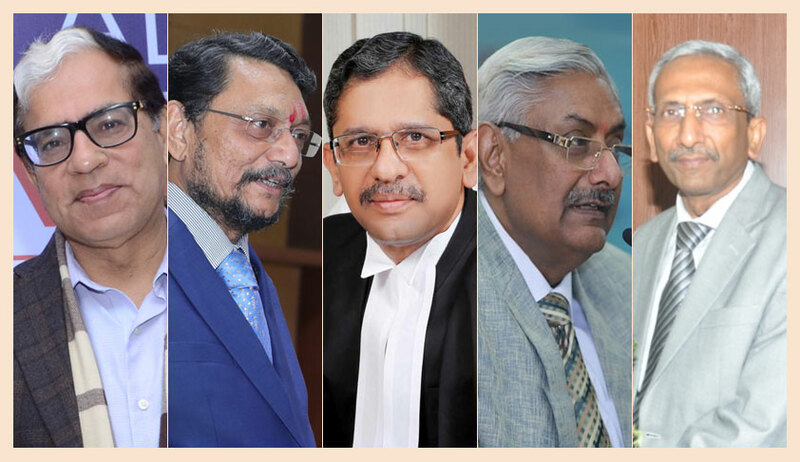 “The petition has been filed but it has not been numbered so far...the Registrar cannot take orders from the Chief Justice in this matter...for 45 years, the practice has been that the listing of a matter which the CJI cannot or is unable to determine has to be decided by the second seniormost judge...the procedure is simple...if Your Lordships wish to depart from it [unclear]...”, submitted Mr. Sibal. Advocate Prashant Bhushan added that the Supreme Court Rules of 2013 also provide the same. “Please take a judicial view of the matter...so that in the future, the course of action is clear...we are only concerned with the listing...Your Lordships may not pass any orders”, pleaded Mr. Sibal. The Petition filed before the Court asserts that the rejection of the motion is "ex facie illegal, arbitrary and violative of Article 14", and seeks quashing of the order. The Petition lists down the reasons given by Mr. Naidu to reject the motion and contends that Article 124 of the Constitution of India does not vest him with any quasi judicial powers in the process of removal of a Supreme Court Judge. It explains, "The Impugned Order proceeds on an erroneous assumption in law that the Chairman/.Speaker, exercises quasi-judicial powers to determine whether to admit or not to admit a notice of motion and whether to constitute the aforesaid Committee. The Chairman/Speaker has to ensure that the signatures of 50 Members of the Rajya Sabha/100 members of the Lok Sabha as the case maybe, is in order and consequently refer the same to the Committee as contemplated under Section 3(2). The Chairman cannot sit and adjudicate over the adequacy, veracity and legal tenability of the allegations/charges contained in the said Notice." It further relies on Section 3 of the Judges Inquiry Act, 1968, which provides investigation into misbehavior or incapacity of a judge by a three member committee, and submits, "Section 3 of the Inquiry Act, therefore, contains the substantive provision for creation of a statutory mechanism to enquire into the allegations against judges of the Supreme Court and the High Court. This statutory mechanism is the three member committee, as stated hereinabove. The Chairman/Speaker has no role whatsoever with regards to this Committee, excepting ensuring that said Committee is duly constituted." The Petition however, demands that Section 3(1) of the 1968 Act, insofar as it enables the Chairman/Speaker to exercise his discretion on the allegations contained in a notice of motion be declared ultra vires Article 124 (4) and 124 (5) of the Constitution of India.